Glenwood's first Spring Fair took place on Wednesday. Everyone had a great time playing games, having their faces painted, petting the animals, jumping in the bouncy castles and enjoying the BBQ, sweets and cakes. On 27th March P7W enjoyed an excursion to the Shankill Leisure Centre with St. Clare’s and The Peace Players. The pupils from both schools got to play basketball with Leif and all the volunteers as well as getting the opportunity to learn about each other; all their similarities and differences. Next week we head to Grosvenor Community Centre for more Peace Players fun. On Wednesday 20th March, some of our P6 and P7 boys and girls took part in the Belfast section of the IFA’s Futsal competition. The groups games saw both teams coming away with 2 wins, 2 draws and 2 defeats meaning both teams finished 4th in their respective groups and qualified for the semi-finals. A special mention to Lewis Baker (P6) who scored all 4 goals in a 4-0 win against Lowood, a very difficult task considering the game lasted 6 minutes. Finishing 4th meant that both the boys and the girls played against the teams who finished top of the league tables. The boys played against St. Bernard’s while the girls played against St Clare’s.Both teams put in a lot of effort throughout the day but unfortunately both teams were beaten in the semi-finals. Every pupil who represented the school were excellent throughout the day and showed great sportsmanship. Everyone at Glenwood is very proud of both teams. 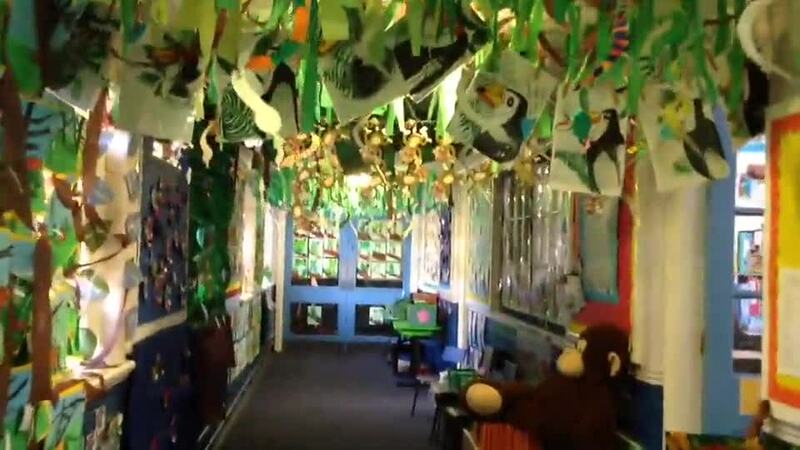 This year we had a jungle theme to explore in our literacy lessons. The children enjoyed reading and writing stories, poems and information texts about jungle animals and settings and created fantastic artwork to display around our classrooms and corridors. We invited our friends and families to come to our jungle exhibition on Friday 15th March to see our artwork and creative writing. For those of you who couldn't make it to the exhibition, please watch our video below to see the wild and wonderful journey through our school building. Our P.5 children recently completed a 6 week programme with Life Guards. Laurence, who is the Children’s Work Co–ordinator for Willowfield Parish Community Association, developed Life Guards to tackle obesity and mental health.Throughout the sessions, they discussed topics like exercise, nutrition, setting targets, not being afraid of failure, dreaming big and working hard. Additionally, the children also took part in four 1 hour long fitness lessons and some children received awards for the top boy and top girl as well as the most improved or best attitude. The children really enjoyed the programme and learned a lot about the importance of looking after themselves. We hope to welcome Life Guards back to Glenwood in the near future. 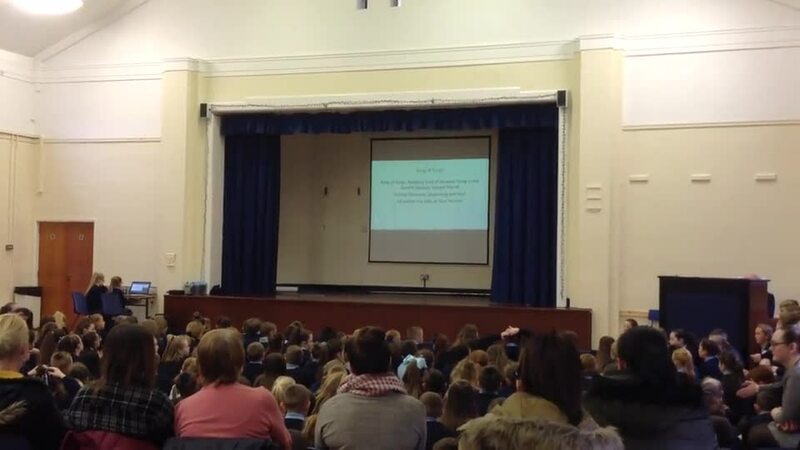 On Wednesday 13th March, our drama club took part in the 'play in a day' production . The ensemble production was directed by Sinead from Konflux Theatre, a theatre company based in England. The children had no knowledge of the 'Rainforest' themed script until the end of the play. 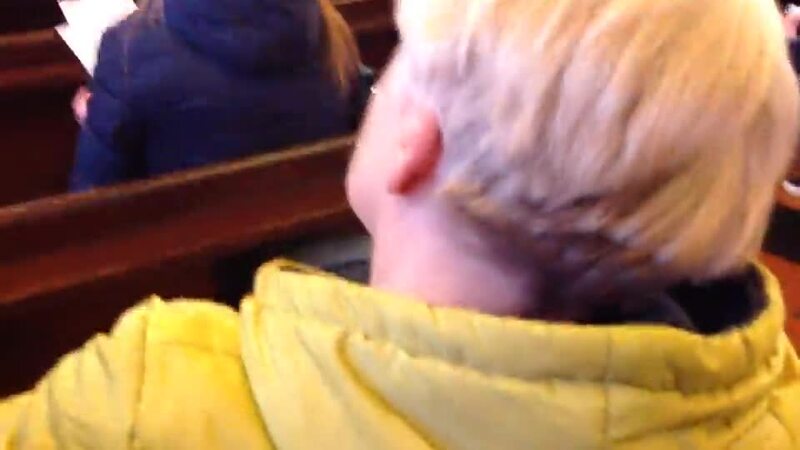 The children had a wonderful day and performed their play to the P5 children and teachers who were all very impressed with their acting skills and sound effects. Watch a video below of their wonderful rainforest sound story. The Primary 6 Football Team played in a cup match on Wednesday afternoon against Stranmillis Primary School at the YMCA Centre in Stranmillis. The game itself was a fantastic battle between two sides trying their hardest to get the opening goal and take control of the game. Unfortunately for Glenwood it was Stranmillis who took the lead halfway through the first half, a brilliant break from midfield saw Stranmillis get a shot away that was well blocked but falling to another Stranmillis player who fired home into an open goal. Glenwood battled well throughout the rest of the game and had a couple of chances to level the score but Stranmillis took advantage of the counter attack and managed to double their lead. The game finished 2-0 which means the P6 team are out of the competition but they can hold their heads high as they fought hard and represented the school superbly. Each child was a credit to the school and showed character to work hard throughout the game. Some members of the Girls’ Sports club played in a 5-a-side football tournament in Shankill Leisure Centre on Wednesday 6th March. They all showed great determination and sportsmanship and most important enjoyed themselves. To celebrate World Book Day on Thursday 7th March we dressed up as our favourite book characters and jungle animals. 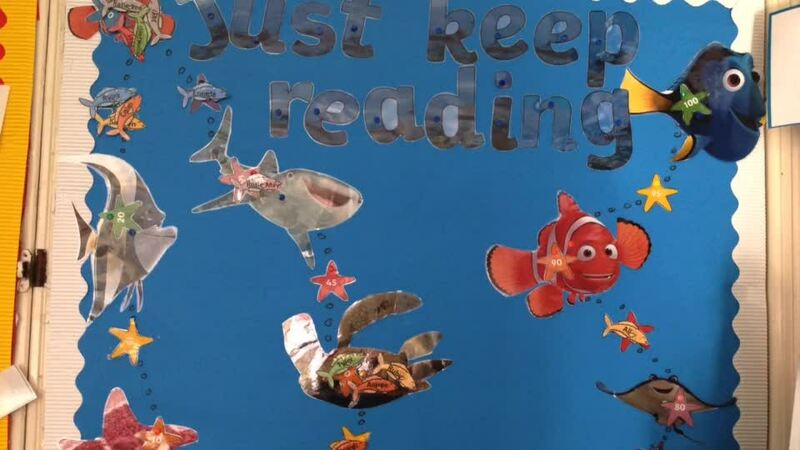 P5 O'Hanlon led an assembly to kick things off and we spend the day writing book reviews, reading our favourite stories and learning about the importance of reading. On Friday 1st February, we hosted a Hot Chocolate Café for all the children who had an attendance record of 95% or above for Term 1 (September-December). They each received a hot chocolate drink with marshmallows and a cookie. Well done everyone! We will be having more treat days in the coming terms so everyone is making a big effort to come to school each day. On Wednesday 16th October, Glenwood had the pleasure of welcoming ‘Fitness Freddy’ to our school. Every year group from P1 to P7 had the chance to work with Freddy. The boys and girls had a great time dancing and working out to music and we even heard the teachers got involved too. Thank you Freddy for coming out to us, the boys and girls really enjoyed it. Lots of children won prizes from Tesco for their Christmas Colouring Competition. Their wonderful art, along with all the other entries can be seen at lots of Tesco stores; so look out for them next time you shop! 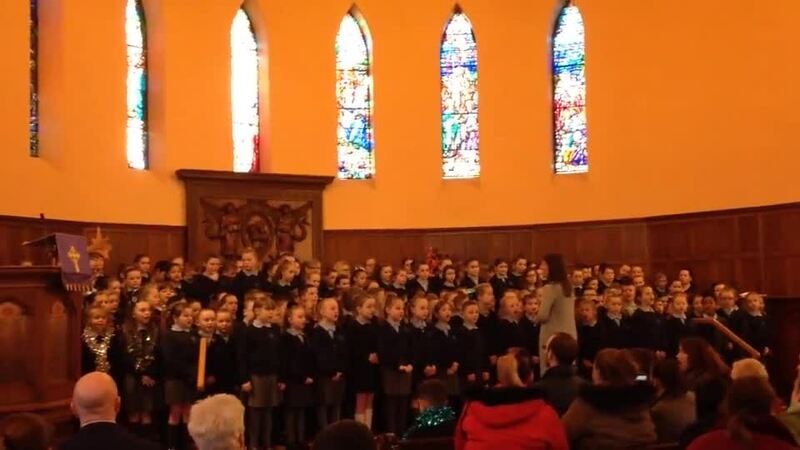 On Wednesday 19th December, our P4-7 children sang carols at St Matthew's Church. 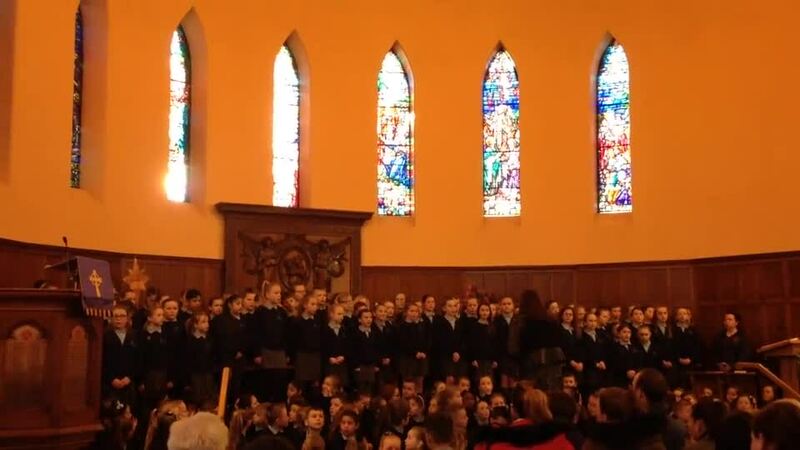 The Junior and Senior Choirs both sang beautifully and the soloists were exceptional. We also had performances on the bells by the P7 classes, a poem recited by P5s and a variety of readings explaining the meaning behind the carols and the real meaning of Christmas. The P7 classes performed 'Scrooge' for their Christmas play this year. 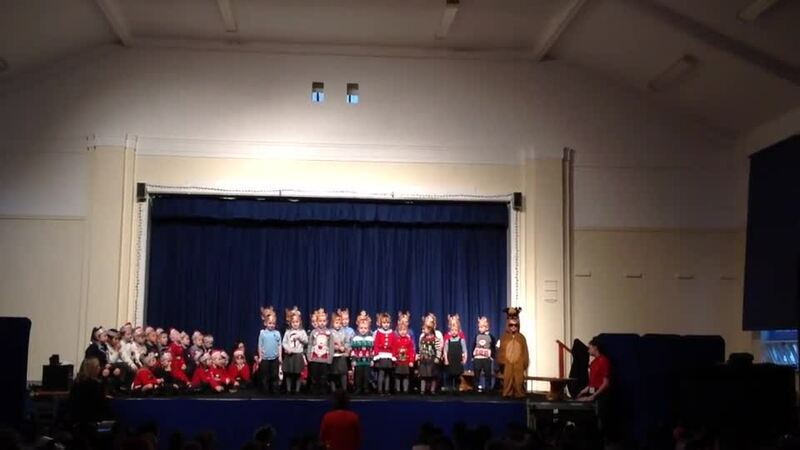 They sang and acted in their own version of the play and certainly looked the part! 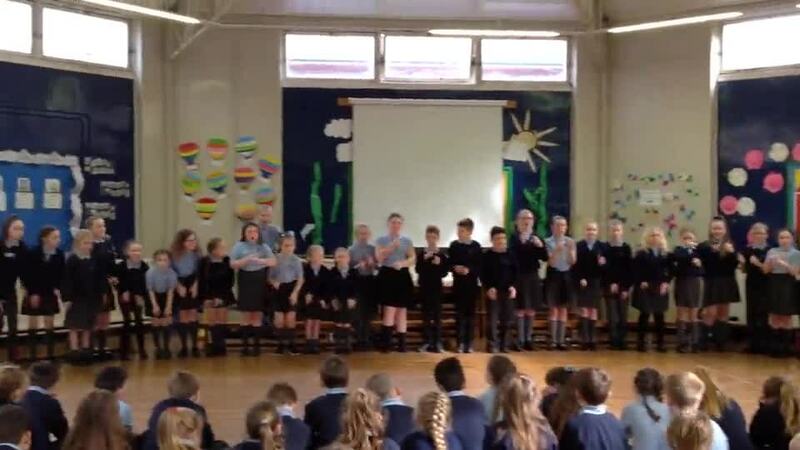 The audience were blown away by their acting and singing talents, especially the solo performances. 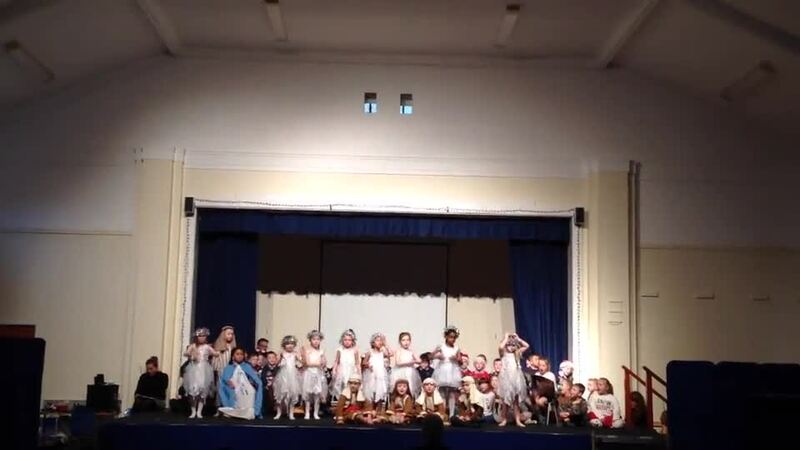 Our P1-P3 children performed their nativity play last week. Our P1 children dressed as snowmen, singing and dancing to a variety of wintery tunes and reciting poems whilst our P2 classes sang and danced along to Christmas songs, featuring a special guest appearance from Santa's less well-known reindeer, Blitzen. 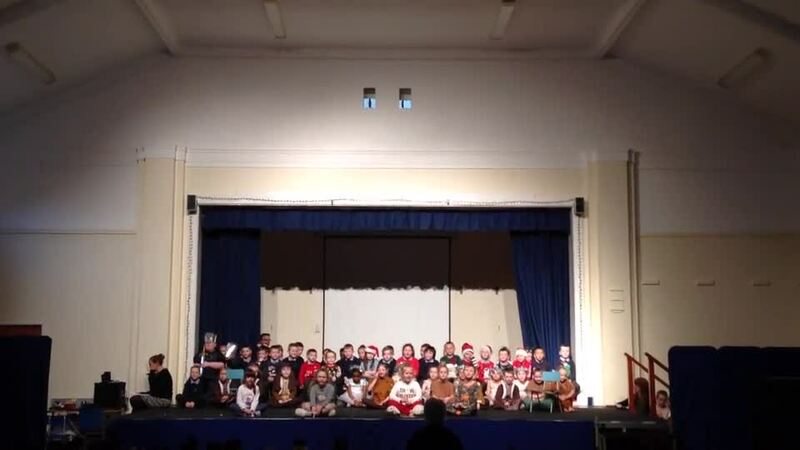 Our P3 classes told the story of how Jesus was born and taught us the real meaning of Christmas. As this year marks 100 years since World War 1 ended, our pupils and teachers decided to make this year an extra special Remembrance Day. Our pupils have been learning about why Remembrance Day is so important and have also been incorporating the poppy into their art lessons. Our Junior Choir (P4 and P5) visited Tennent Street Care Home this week to sing some war time favourites to the residents and staff. 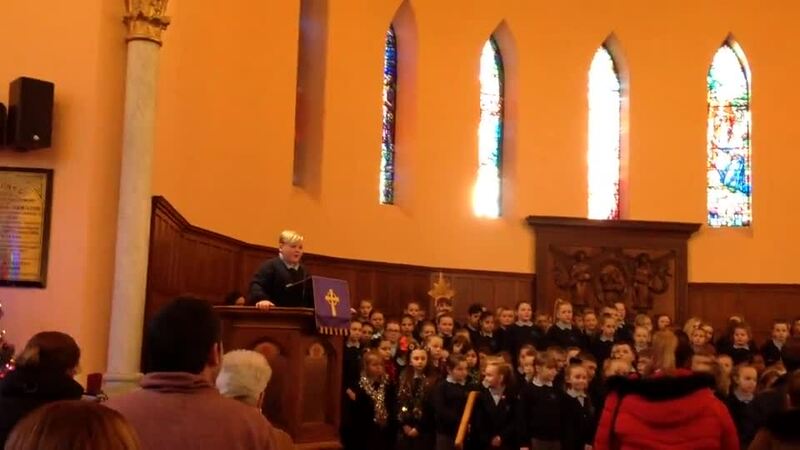 Our P6 and P7 pupils also led a Remembrance Day assembly by reciting poems, stories and facts about the war. We also had some beautiful singing from our Senior Choir and Reverend Duncan gave us a special Remembrance Day message and led us in prayer. The children in Glenwood worked really hard during maths week exploring patterns, solving problems and exploring maths all around them. This week helped the children to realise the fun in Maths and see how relevant it is in the world around us. A big thank you to the children who took photographs showing how maths exists in their everyday life. the P6 classes visiting the MAC Theatre to see an exciting show about Maths and Science. the P4 classes visiting Stranmillis University to watch Bubblz, the mathematical clown. P6 and P7 classes had fun using IZAK 9 cubes to explore mathematical concepts and language. The P5 classes had great fun solving maths’ puzzles both outside and in large hall. Today we celebrated Harvest with a wonderful service and collection of food items and clothing. 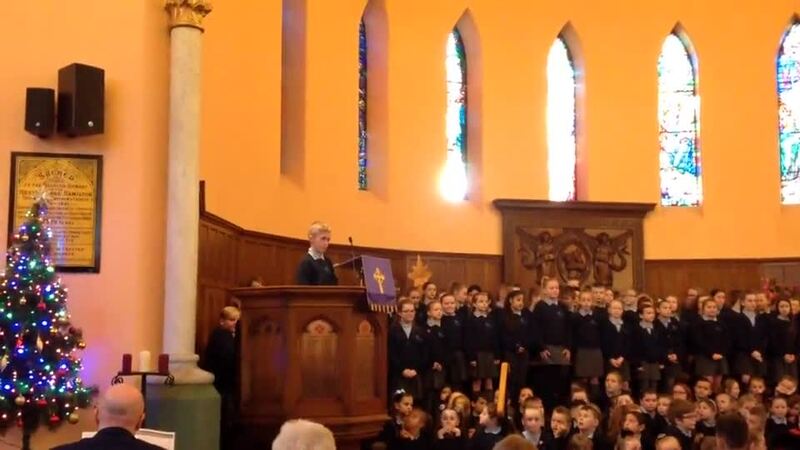 Each year group performed a song, poem, story or prayer for the entire school and we prayed for those in need. We remember how grateful we are at this time of year and try to help those who are less fortunate. We would like to send a huge thank you to all the children and parents who donated dried food and tins and to our staff who provided fresh fruit and vegetables as well as some items of clothing. The donations were collected today by Storehouse and will be distributed to families all over Belfast who need them. The reflective cut-outs are being used to stop people parking at our school entrance in a bid to keep our children safe. Specially made for the Greater Shankill ACT group, the signs carry warnings like ‘do not park here’ and ‘no parking’ to deter people from stopping at the zig-zag lines in front of two schools. On Thursday 4th October our P3-7 classes had a special visit from the Image Musical Theatre. They performed a play called 'The Selfish Giant' based on the Oscar Wilde short story. Lots of children got to help act out the story while the rest of us helped sing the songs to bring the story to life. It was really funny and we learned an important lesson; live your life with a loving heart. We celebrated the European Day of Languages with a week of language learning in Glenwood. Our P6 year group led a whole school assembly telling us about the different traditions, languages and delicacies from all over Europe. 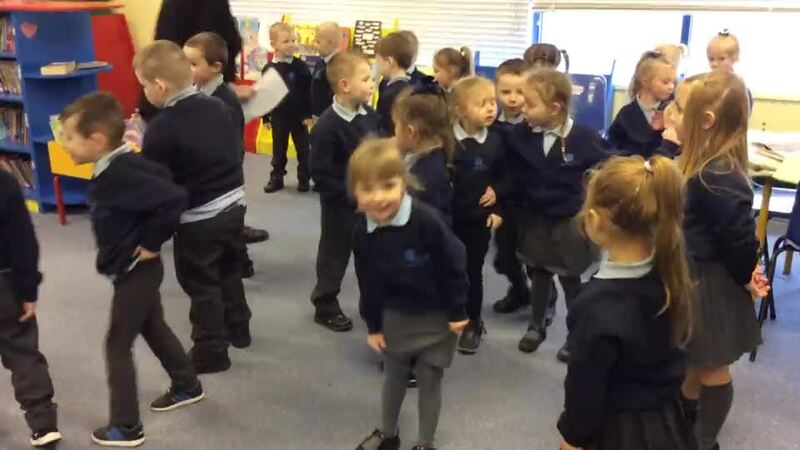 Our children enjoyed learning Spanish, French, Italian, Slovakian, Portuguese, Romanian and Polish with their teachers by singing songs and playing games. Some classes even had a food tasting lesson with food from their chosen country.